Ask fellow campers about "Lakeshore RV Park" and nearby attractions. Pool and playground were small but fun for our 7, 11, and 13 yo. Lots of shaded campsite areas, even some grass for our dog. The fire rings were set in the back of the lot which was nice. Very peaceful and tranquil. The mini golf was run down and full of grasshopper sized wasp looking insects. They didn't bite, but swarmed all over the holes. It was nice that you could run a tab in the office - the kids liked the slushies; it was a fun treat. 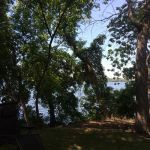 We camped at Lakeshore RV Park in a Travel Trailer. Beautiful campground right along Big Stone Lake. We had a lakeside spot but was tight to get into because of a wooden split rail fence. The staff was friendly, accommodating and the campground very well maintained. They gave us a ride in the golf cart to show us the site availability before we registered, to make sure we thought we could fit. This is a family run business and you feel like your business is welcome. Very children friendly campground. They offer many amenities, but if you do not use them or have children to enjoy the accommodations that they provide, the rate is a little steep. We camped at Lakeshore RV Park in a Travel Trailer. Rate is for pull through or lake site. Pull through nicely designed so you do not have to disconnect toad to reach services. Sites are level enough to be comfortable in a motorhome. Guided to site. Plenty of room between sites in pull through area. Three dollars extra for Cable TV. So rate should be $43. We camped at Lakeshore RV Park in a Motorhome. Nice little campground if in the area. Nothing special to drive 2 hours to go to. Sites on the lake are nice but tight. Pool was very warm and the kids had fun. Mini golf had a ton of hornets hanging around, but seemed to not be bothered by golfers. Owner was very nice and helpful. One of the few campgrounds where you pay when you leave. We would go again if in the area. We camped at Lakeshore RV Park in a Motorhome. The park has lots of seasonals but they are well maintained. There are lots of activities for the kids and we stayed in a level pull-thru gravel site with grassy areas between. We had no problems with either our Verizon broadband card or cellular service. We would stay here again. We camped at Lakeshore RV Park in a Motorhome. This is a great family park. In addition to the basics, there are a lot of other activities such as Mini-Golf, arcade games, boating, fishing and bumper boats. The owners pride themselves on their customer service and will go out of their way to help, e.g., putting your boat in the water. The sites along the lake are nicely shaded. We camped at Lakeshore RV Park in a Motorhome. Are you affiliated with Lakeshore RV Park ?